The Happening was one of the premier music events that ran as a series for quite a number of years. Initially organized by Club Valencia as a fund raising event, it soon portrayed leading bands and was transformed into THE music event at that time. Our band was called “No Limits” and had a young and energetic audience who could associate with our band-sound. We played mostly our originals, some of which which was recorded but never released. 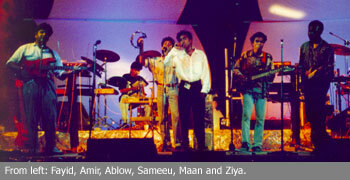 Sadly, this was the last No Limits performance of this line-up – the band disbanded due to differences among us.